Cambridgeshire, Hertfordshire and Bedfordshire is serviced by Biggleswade Plantation Shutters by Just Shutters! Our local expert services the market town of Biggleswade and its surrounding areas. Shutters are a perfect window covering that combine both beauty and practicality. In addition to this, they look stunning and offer incredible benefits not least of all the fact they are just so easy to maintain. Please take a look at our beautiful shutter galleries which will give you a taste of the stunning shutters we have designed and additionally installed. Find out more about striking plantation shutters on our ‘what are plantation shutters?’ page, and see just why they are perfect for your home. Secondly whether modern or traditional, a lounge bay window, or unusual shaped atrium, we have seen and fitted them all, no job too big or too small. Our Biggleswade Plantation Shutter expert will be on hand from design to installation and throughout your lifetime guarantee with Just Shutters. As a local Hertfordshire business, we are the specialists who will be able to advise and implement the very best shutters in your area. With an enviable reputation and passion for perfection, we will listen and advise to ensure you get the perfect shutters for you. Shutters provide excellent value year after year. Curtains or blinds can often feel like a ‘value’ option but after years of wear and tear nothing stands the test of time like beautiful plantation shutters. Ours come with a lifetime guarantee, so as long as you own the shutters we will be there to ensure they look and operate to perfection year after year, now you wont get that with curtains or blinds! Do shutters bleach in the sun? No, unlike fabrics or untreated woods, shutters are made with superior quality and finished to withstand the test of time. Will they suit my home? Whatever your style of home or décor, you can be sure there is a shutter style to match, please see our shutter styles page for more on how we can suit any property – from modern flats, to traditional mansions, and everything in between. Is there a range of choices? Yes, the possibilities are quite endless. Not only do we have a range of materials and finishes, we have an array of louvre sizes, as well as shutter styles and can even colour match to make sure that every taste is accounted for. For more of your questions answered please visit our FAQ pages, or call to speak to us directly on 01223 632887. You can request a brochure for further inspiration, arrange a free design consultation in which you can ask our designer any questions, see samples in the comfort of your own home, and get an individual design and quotation. 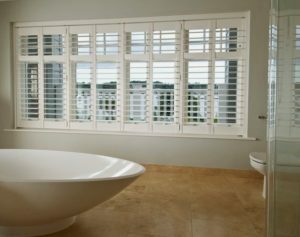 Call us on 01223 632887 to discuss how Biggleswade Plantation Shutters would work for you.